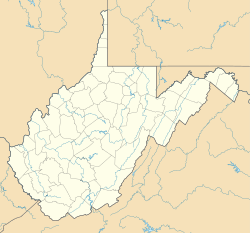 Bluefield is located at 37°15′44″N 81°13′7″W﻿ / ﻿37.26222, -81.21861 (37.262219, −81.218674) in the Appalachian Mountains of West Virginia near Bluefield, Virginia. According to the United States Census Bureau, the city has a total area of 8.86 square miles (22.95 km2), all land. Bluefield is a mountain city with a humid subtropical climate (Cfa) bordering on oceanic (Cfb) and humid continental (Dfa/Dfb.) It is characterized by moderately cold, snowy winters and pleasantly warm to hot summers. The hottest temperature ever recorded in the city was 97 °F (36 °C) with the coldest temperature at −21 °F. As of the census of 2010, there were 10,447 people, 4,643 households, and 2,772 families residing in the city. The population density was 1,179.1 inhabitants per square mile (455.3 /km2). There were 5,457 housing units at an average density of 615.9 per square mile (237.8 /km2). The racial makeup of the city was 73.7% White, 23.0% African American, 0.3% Native American, 0.5% Asian, 0.2% from other races, and 2.3% from two or more races. Hispanic or Latino of any race were 0.9% of the population. There were 4,643 households of which 26.1% had children under the age of 18 living with them, 38.6% were married couples living together, 16.5% had a female householder with no husband present, 4.6% had a male householder with no wife present, and 40.3% were non-families. 35.0% of all households were made up of individuals and 15.1% had someone living alone who was 65 years of age or older. The average household size was 2.21 and the average family size was 2.83. The median age in the city was 43.1 years. 20.8% of residents were under the age of 18; 9.2% were between the ages of 18 and 24; 22.2% were from 25 to 44; 28.6% were from 45 to 64; and 19.2% were 65 years of age or older. The gender makeup of the city was 46.8% male and 53.2% female. As of the census of 2000, there were 11,451 people, 5,038 households, and 3,078 families residing in the city. The population density was 1,311.3 people per square mile (506.4/km²). There were 5,966 housing units at an average density of 683.2 per square mile (263.9/km²). The racial makeup of the city was 75.84% White, 22.14% African American, 0.12% Native American, 0.56% Asian, 0.01% Pacific Islander, 0.21% from other races, and 1.13% from two or more races. Hispanics or Latinos of any race were 0.52% of the population. There were 5,038 households out of which 24.7% had children under the age of 18 living with them, 43.5% were married couples living together, 13.9% had a female householder with no husband present, and 38.9% were non-families. 34.9% of all households were made up of individuals and 17.5% had someone living alone who was 65 years of age or older. The average household size was 2.23 and the average family size was 2.87. The age distribution was 21.5% under the age of 18, 9.0% from 18 to 24, 23.5% from 25 to 44, 24.5% from 45 to 64, and 21.5% who were 65 years of age or older. The median age was 42 years. For every 100 females there were 84.4 males. For every 100 females age 18 and over, there were 79.5 males. The median income for a household in the city was $27,672, and the median income for a family was $36,508. Males had a median income of $31,396 versus $21,051 for females. The per capita income for the city was $17,751. About 13.0% of families and 19.3% of the population were below the poverty line, including 28.2% of those under age 18 and 10.9% of those age 65 or over. The history of Bluefield begins in the 18th century, when two families settled in a rugged and remote part of what is now southern West Virginia, and built a small village with a mill, a church, a one-room schoolhouse, and a fort for defending the small settlement against invasions by the much larger Shawnee Indian tribe on the banks of the Bluestone River. The Davidson and Bailey family had to sell a portion of their land when in 1882, Captain John Fields, of the Norfolk and Western Railway pioneered the area and began building a new railroad through the hills of Bluefield. The city is traditionally thought to be named after the chicory flowers in the area that colored the landscape a purplish blue hue during the summer. However, research has indicated that this settlement which was also known as Higginbotham's Summit in the 1880s was probably named for the coal fields of the Bluestone River. Beneath the land of the Davidsons and Baileys lay the largest and richest deposit of bituminous coal in the world – the soft burning coal which was ripe for fueling the industrial machines of the developing world. The first seam was discovered in nearby Pocahontas, Virginia in the backyard of Jordan Nelson which was, in the words of President Frederick Kimball of the Norfolk and Western Company, the "most spectacular find on the continent and indeed perhaps of the entire planet." The seam is also mentioned in Thomas Jefferson's "Notes on the State of Virginia", but it was not mined until 1890. Around that time, the coal mines that soon opened up in the area—around Harman, Bluefield, War, and Pocahontas—were known as the Pocahontas Coal Fields; they helped drive the Industrial Revolution in the United States and fuel the American and British navies during both World Wars. The herculean effort to extract the coal from the mountains created a vast boom in the local and national economy, bringing emigrant European workers to the mountains in search of work. In the one-year period from 1887 to 1888, passenger travel along the railroad increased 317%. Like the extremely accelerated growth San Francisco experienced during the gold rush, Bluefield became a city that sprang up "overnight," and it far outpaced the infrastructure available to it at the time. Urban sprawl and blight were common complaints in the early days. Bluefield was not a city that controlled its own destiny. Indeed, the growth and decay of the city depended almost entirely upon Norfolk and Western Railroad—which in turn regarded the whims of the international market as a higher priority than the longevity and prosperity of Bluefield. When coal tonnage was good and the market for coal was booming, Bluefield was essentially a "Little New York," as it was called in the day. A bustling metropolis, it had a nightlife and a personality that was "a little bit Chicago, a little bit New York, and a whole lot of Pittsburgh"—rugged and with steel and coal embedded in its soul. The coal boom fueled a flood of money into the area, and nearby Bramwell, incorporated in 1888, boasted itself as the "Millionaires' Town" because more millionaires per capita lived there than anywhere in the nation. The city also had more automobiles per capita than any other city in the country at the time which meant that, in the early days, Bluefield experienced the "five o'clock traffic jam/gridlock" long before the majority of the rest of the nation—even before New York City. Also called "Summit City" because of its high elevation and its naturally sloping divides in the coal yards, Bluefield became one of the first cities in the world to have a noticeable skyline – with highrises that were comparable to New York and Chicago in their day. Today, although many of those highrises remain, they are no longer similar to the many famous skylines in many modern American cities. Primarily due to the introduction and globalization of other fuel sources, today's Bluefield does not resemble the Bluefield of long past. Bluefield is now a much quieter town compared to the boom between 1890 and 1960. Many rundown remnants of once-grand mansions and office buildings still remain in the north side of town near the railroad tracks. In 1889, the city of Bluefield was officially incorporated. The city government was always known in those days as being corrupt, inefficient, with drunken brawls and fights breaking out on the floor of City Hall on an almost daily basis. With a strong ethnic community, Bluefield was the site of the 1895 founding of the Bluefield Colored Institute, the nation's first college with primarily black students. That college is today's Bluefield State College, and the site of a November 21, 1968 bombing. During the 1920s, the most impressive high-rise in Bluefield history was built, the twelve-story opulent West Virginian Hotel, now the West Virginia Manor and Retirement Home. In 1924, nearby Graham, Virginia decided to rename itself Bluefield, Virginia to try to unite the two towns, who had been feuding since the civil war. Nobel Prize–winning economist and mathematician John Forbes Nash was born in Bluefield in 1928. The Great Depression however, broke the city's back. With the government nearly bankrupt, and series of devastating structural fires that swept through the downtown area and nearly took down every high rise the city had so feverishly built, the city was nearly destroyed. It was not until World War II came that the coal fires started burning again. The importance of the city was so great that Adolf Hitler even put Bluefield on his reputed list of German air raid targets in the United States. Air raid practice drills were common in the city during this time. The Interstate Highway System finally passed through East River Mountain in the 1960s, and for the first time automobile traffic could pass through the city without crossing the top of the mountain. The dependence on railroad traffic waned and the city began to shrink in population and eventually lost its Amtrak station in the 1980s. Mercer Mall, the area's major shopping mall opened in 1980. Thomas Edd Mayfield, one of the Mayfield Brothers Bluegrass musicians of West Texas, died of leukemia in a Bluefield hospital in 1958 at the age of thirty-two while he was on tour with Bill Monroe and the Bluegrass Boys. Bluefield prides itself on its hospitable climate. Since 1938 the Chamber of Commerce has given free lemonade when the temperature has surpassed 90 °F. The city's motto is "nature's air conditioned city, where the summer spends the winter." Jazz musician Louis Jordan's song "Salt Pork, W.Va." was inspired by his time in a Bluefield jail. A controversy exists over whether or not Hank Williams was last seen alive in Bluefield on his way to a show in Ohio. He was discovered dead in Oak Hill, West Virginia. Bluefield is mentioned in the Stylistics' song Rockin' Roll Baby as the birthplace of Li'l Joe. Bluefield was the home of the Appalachian League (rookie) Bluefield Orioles baseball team until 2010. The Orioles have had a team in Bluefield since 1958, which was the longest relationship between a parent club and a town in affiliated baseball. The Toronto Blue Jays replaced Baltimore for the 2011 season with the Bluefield Blue Jays. The team plays at Bowen Field (former Orioles stadium) and several renovations have been made to the ball park. Bluefield High School has 22 state championships in all sports, which is more than any other AA school in the state. Bluefield ranks third in total football state championships with ten. They trail now closed Ceredo-Kenova High School (12) and national powerhouse Parkersburg High School (11). Bluefield is largely a football town and the rivalry between the Bluefield Beavers and their sister city Bluefield, Virginia's Graham G-Men always draws a large crowd at Mitchell Stadium. 2005 saw the introduction of the Bluefield Barons, an Alliance Football League team. Bluefield is also home to the East River Soccer Complex which has five fields and hosts local high school and college soccer games. The Southern West Virginia King's Warriors of the USL PDL play their home games at the East River Soccer Complex. ^ "US Board on Geographic Names". United States Geological Survey. October 25, 2007. http://geonames.usgs.gov. Retrieved 2008-01-31. ^ "US Gazetteer files: 2010, 2000, and 1990". United States Census Bureau. February 12, 2011. http://www.census.gov/geo/www/gazetteer/gazette.html. Retrieved 2011-04-23. ^ "Monthly Averages for Bluefield, WV". The Weather Channel. http://www.weather.com/outlook/health/fitness/wxclimatology/monthly/USWV0082. Retrieved 2011-05-17. ^ "Orioles leaving Bluefield". Bluefield Daily Telegraph. August 28, 2010. http://bdtonline.com/local/x329608842/AFTERNOON-UPDATE-Orioles-leaving-Bluefield. Retrieved August 29, 2010. ^ "Orioles out of Bluefield". Orioles Insider: Baltimore Sun. http://weblogs.baltimoresun.com/sports/orioles/blog/2010/08/orioles_out_of_bluefield.html. Retrieved August 29, 2010. ^ "King's Warriors Make Move To Bluefield". United Soccer Leagues (USL). February 8, 2014. http://www.uslsoccer.com/home/786408.html. Retrieved February 8, 2014. This page uses content from the English language Wikipedia. The original content was at Bluefield, West Virginia. The list of authors can be seen in the page history. As with this Familypedia wiki, the content of Wikipedia is available under the Creative Commons License.